Four hikers died from inhalation of volcanic gases after being exposed to fumes on the floor of Numano-taira (also called Numano-daira) crater on 15 September. The hikers were part of a group of 14 Tokyo barbers who became disoriented in foggy conditions and departed from a trail. After three hikers fell at the head of a small valley in the S rim of the crater, another member of the party attempted a rescue but also fell to the floor of the crater, where deadly gases had accumulated due to light northerly winds. Other hikers in the area noticed a strong sulfuric odor, warned others of the danger, and climbed to higher ground. Signs warning of the volcanic gas hazard were posted at the trail head. According to scientists at the Kusatsu-Shirane Volcano Observatory, fumarolic gas from the SW part of the crater is composed of 0.5% SO2, 60-65% H2S and 33-37% CO2. Gas collected in July from a mud pond on the crater floor contained 41% H2S and 56% CO2. The most likely reason for the fatalities was the presence of the H2S and the calm wind conditions that allowed gases to accumulate in the lowest part of the crater. The Japan Meteorological Agency (JMA) released a report on recent activity at the volcano including a volcanic gas advisory on 15 September. The report details 5 volcanic earthquakes that occurred in August and increased mud spouting and fumarolic activity. Other activity reported at the crater included mud effusion at three pits on the crater floor in July and August 1996 as well as a very small-scale phreatic explosion on 1 September 1996 (BGVN 21:08). Information Contacts: Jun-ichi Hirabayashi, Kusatsu-Shirane Volcano Observatory, Tokyo Institute of Technology, Kusatsu, Agatsuma-gun, Gunma 377-17, Japan; Noritake Nishide, Sendai District Meteorological Observatory, Japan Meteorological Agency (JMA), 1-3- 15 Gorin, Miyagino-ku, Sendai 983, Japan; Yoshihisa Kawanabe, Volcanology Section, Environmental Geology Department, Geological Survey of Japan, 1-1-3, Higashi, Tsukuba, Ibaraki, 305 Japan; Tatsuro Chiba, Dept of Disaster Prevention, Asia Air Survey Co., 4-2-18 Shinjuku, Shinjuku-ku, Tokyo 160, Japan (URL: http://www.ajiko.co.jp/en/); Volcano Research Center, University of Tokyo, Yayoi, Bunkyo-ku, Tokyo 113, Japan (URL: http://www.eri.u-tokyo.ac.jp/VRC/index_E.html). The Global Volcanism Program has no Weekly Reports available for Adatarayama. During 27 October, volcanic tremor of about 3-minutes duration was recorded at a site 4.8 km NE of Adatara's summit (station A). This was the first case of tremor since the local observatory began observations in 1965. On 12, 15, 25, and 26 April, small-amplitude volcanic tremors were detected. Volcanic tremor was previously recorded on 27 October 1995 (BGVN 20:10), the first such occurrence since observations began in 1965. A small-scale phreatic eruption suddenly took place on 1 September. On 4 September a survey team from the Japan Meteorological Agency (JMA) verified that mud was sprayed ~100 m from small pits at the summit area (Numanotaira). Mud crusts and mud flows were found around three pits, and a strong odor of sulfurous gas was noted. Some mountaineers witnessed and photographed this eruption. Although both Tohoku University and JMA monitor seismicity of the volcano, no seismic activity was recorded just prior to or during the eruption. After the eruption, there was also no evidence implying an increase in seismicity. This has been the first observation of eruptive phenomena since monitoring began in 1965. Volcanic tremor was last reported in April (BGVN 21:04). The JMA seismic net also recorded volcanic tremor once in June. A survey by Tatsuro Chiba of Asia Air Survey Co. Ltd. indicated that mud effusion on the Numanotaira crater floor also occurred in July and August of this year. The Asahi TV Company took pictures of mud bubbling in one of the pits during mid-August. According to Tatsuro Chiba, two of three pits in the crater already had existed before 1 September and the third pit might have been formed during the 1 September eruption. Information Contacts: Volcanological Division, Japan Meteorological Agency (JMA), 1-3-4 Ote-machi, Chiyoda-ku, Tokyo 100, Japan; Volcano Research Center, Earthquake Research Institute (ERI), University of Tokyo, Yayoi 1-1-1, Bunkyo-ku, Tokyo 113, Japan (URL: http://www.eri.u-tokyo.ac.jp/VRC/index_E.html). 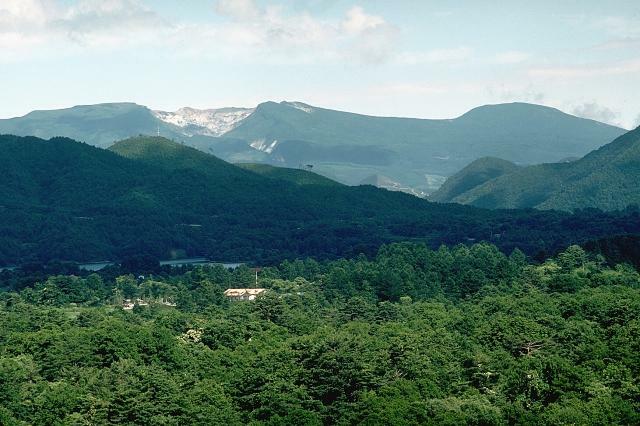 The broad forested massif of Adatarayama volcano is located E of Bandai volcano, about 15 km SW of Fukushima city. It consists of a group of dominantly andesitic stratovolcanoes and lava domes that rise above Tertiary rocks on the south and abut Azumayama volcano on the north. Construction took place in three main stages that began about 550,000, 350,000, and 200,000 years ago. The high point of the complex is 1728-m-high Minowasan, a dome-shaped stratovolcano north of Tetsuzan, the currently active stratovolcano. Numanotaira, the active summit crater, is surrounded by hot springs and fumaroles and is breached by the Iogawa river ("Sulfur River") on the west. Seventy-two workers of a sulfur mine in the summit crater were killed during an eruption in 1900. Historical eruptions have been restricted to the 1.2-km-wide, 350-m-deep Numonotaira crater. Fujinawa A, 1988. Tholeiitic and calc-alkaline magma series at Adatara volcano, Northeast Japan: 1. geochemical constraints on their origin. Lithos, 22: 135-158. Fujinawa A, Hayashi S, Umeda K, 2001. K-Ar ages for lava samples of Adatara volcano: reexamination of formation history of the volcano. Bull Volc Soc Japan (Kazan), 46: 95-106 (in Japanese with English abs). Fujinawa A, Kamoshida T, Tanase A, Tanimoto K, Nakamura Y, Kontani K, 2006. Reconsideration of the 1900 explosive eruption at Adatara volcano, northeastern Japan. Bull Volc Soc Japan (Kazan), 51: 311-325 (in Japanese with English abs). Yamamoto T, 1998. Holocene Sukawa lahar deposits at the western foot of Adatara volcano, NE Japan. Bull Volc Soc Japan (Kazan), 43: 61-68 (in Japanese with English abs). Yamamoto T, Sakaguchi K, 2000. Eruptive history of Adatara volcano, NE Japan, during last 250,000 years based on tephrostratigraphy. Bull Jeol Soc Japan, 106: 865-882 (in Japanese with English abs). There is no Deformation History data available for Adatarayama. There is no Emissions History data available for Adatarayama. The broad forested massif of Adatara volcano, seen here from the west, is composed of a group of stratovolcanoes capped by lava domes. The unvegetated area on the left summit ridge is a 1-km-wide circular crater that is breached by the Iwo-gawa (Sulfur River) on the west. The crater has been mined for sulfur. Seventy-two miners working in the summit crater were killed during an explosive eruption in 1900. There are no samples for Adatarayama in the Smithsonian's NMNH Department of Mineral Sciences Rock and Ore collection. Large Eruptions of Adatarayama Information about large Quaternary eruptions (VEI >= 4) is cataloged in the Large Magnitude Explosive Volcanic Eruptions (LaMEVE) database of the Volcano Global Risk Identification and Analysis Project (VOGRIPA).